Is there anything about this that is not up to code? Does the rule about attaching the wire to a stud or something within 12” of a box apply here? 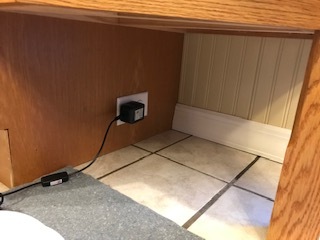 Was it okay to put an outlet in this space in bottom of cabinet? Since it is not actually serving the countertop and appears to be a reasonable distance from a sink, apparently this does not need to be GFCI protected. However, GFCI protection may still be a good idea, either at the receptacle (which I can see it is not), at the breaker or somewhere in between. While it is unlikely that you'll be reaching down to plug/unplug appliances while your hands are wet (which can easily happen at the real countertop receptacles), kitchens get wet, especially on the floor (at least in my house) so I think it would be a good idea. 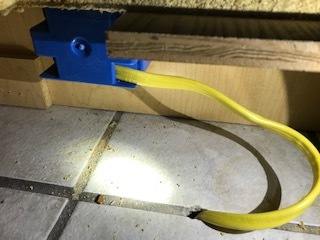 First off, I definitely would have a conduit where the Romex entered from the basement through the subflooring and tile to avoid the wire from being crimped. Also since it is located in a kitchen where water from spills, broken pipes, dishwasher mishaps can happen it should be on a GFI circuit if not a GFI plug. In Florida that connection would be a point of concern and would be flagged for home inspection. Not the answer you're looking for? Browse other questions tagged wiring kitchens or ask your own question. Can I add a framing block along a cable to meet stapling code requirements? 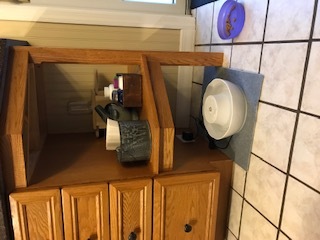 Bottom shelf of cabinet, support weight of itself? Should I build a shield to protect building wire installed inside cabinet?